Tralee is a conversation-starter. Of all the courses in Ireland’s top tier, this is the one that inspires the most debate among golfers. The rub seems to be Tralee’s back nine, with its large helping of “go for broke" shots, which some say make a round here too much a matter of chance. Others see an older, more personal style of golf expressed (or even enforced) in the layout. Everybody agrees on the quality of the scenery. The only debate is on whether or not it beats out Old Head of Kinsale for the title of “most beautiful course in all of Ireland." Placed along a spectacular beach in the very rural townland of West Barrow, eight miles west of Tralee, the course features stunning views of the Atlantic and nearby Slieve Mish Mountains (literally “Blue Mountains" in Gaelic) from almost every hole. Says course representative Eugene O’Callaghan, “from here in the clubhouse I can see the Dingle Peninsula, Ballybunnion about 15 miles off, and in the other direction, New York." Even if you’re game isn’t working, it’s a spectacular place to walk. Though the course has a distinctly ancient feel, it was actually built in 1983 under the direction of Arnold Palmer. It is, in the words of Mr. O’Callaghan, “a bit more testing than Ballybunnion." The first nine take you back and forth across a wide field winding down toward the water, with the 2nd, 3rd and 8th holes all hugging the ocean cliffs. Your first “go for broke" shot comes on the 194-yard par three 3rd, out onto a slim finger of land where anything left, right or long will put you into the rocks or water (unless you bounce your shot off the 14th century castle behind the green). Golfers frequently compare this gem of a hole to the famous par-3 16th at Cypress Point. “It’s very exposed," says Mr. O’Callaghan. “The winds aren’t quite like anything you get in America. I know you get hurricanes over there, but you really feel the body of the wind coming in here all the time." The elements are so overwhelming that the third green used to be frequently unplayable. Happily, it’s now grown in enough so that this is not a problem. It’s on your way back in that you’ll get the real flavor of Tralee. The course seems to change gears on the back nine, offering more spectacular vistas and tougher shots. Staring down the 80-foot crevice in front of the 12th green, for example, you may feel a brief prayer makes more sense than a practice swing before your second shot. There’s absolutely no place to land your ball other than on the green. It’s rated the most difficult hole on the course, and for an American player (familiar with Orlando golf and other top U.S. courses), it’s a confrontation with an old-world attitude that match play, and not counting strokes against par, is what golf is really all about. “The course," says Mr. O’Callaghan, “sometimes teaches you to take your punishment and lay off rather than go for a score. It’s a game of patience here." A 156-yard par three doesn’t sound intimidating, until you behold the 13th hole. It takes you uphill to a green guarded in front by a gigantic canyon. The high ridge behind the green makes a long shot just as dangerous as a short one. Another stunning par three, the 200-yard 16th hole, requires an accurate shot from the elevated tee over a stretch of rough, overgrown hills in front of the green, with no fairway to hit. The only poor shot forgiven here is a slight hook left, into the hills that tend to feed down onto the putting surface. Any mistake long or right, and you could easily card a 12 here. 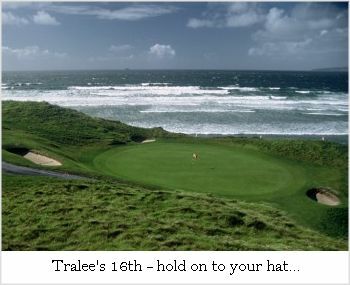 Throughout, Tralee will pressure your medium and long iron game. Whether the course is “tough but fair" as some say, or a bit unreasonable, depends on your viewpoint. The wind is often a deciding factor. “Depending on how it’s blowing," says Mr. O’Callaghan, “you could be hitting a nine iron on a shot one day, and then need a five wood for the same shot the next." If you go with the match play approach, you’ll know that at least half the foursome will be smiling as you walk off the 18th. Taking one last look at this extraordinary place of towering dunes on the sea, you’ll probably be daydreaming about another crack at the course, no matter what you scored on your first go-round.